DLT: 10 Million & Counting! Join the celebration of Our Major Milestone! That’s right! 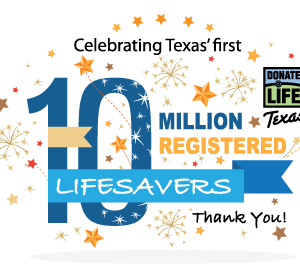 The Donate Life Texas donor registry is celebrating the lifesaving commitment of 10 million Texans who have now joined the donor registry. Since it was created in 2005, the Donate Life Texas (DLT) donor registry has been steadily growing thanks to generous Texans who understand the lifesaving difference each donor makes to the lives of those in need of a transplant. Registering with DLT provides the legal consent for donation and is an easy and convenient way for people to make their decision to donate known after they pass away. Building anything on this scale takes the work of multitudes of dedicated people. DLT relies several partners who each play a critical role in making donor registration easy and convenient. The donor registry was created by and remains part of Texas state statutes. Since 2005, lawmakers from all over the state have supported responsible legislation that makes donor registration simple, straightforward and convenient. Together, Sen. Judith Zaffirini (D-Dist. 21) and Rep. John Zerwas M.D. (R – Dist. 28) have championed the most donor registry-related bills. Each and every Texan who applies for or renews a state driver license or ID card is given the opportunity to register with Donate Life Texas as a donor. This single step relies on the support of thousands of DPS employees and is responsible for roughly 85% of all donor registrations. From health fairs and community events to school rooms and beyond, an army of volunteer advocates are essential to educating the public about the need for donation and the importance of registration. In Texas, 16 Donate Life Texas organizations perform the organ, eye and tissue recovery procedures. These dedicated professionals are also the ones who work closely with donor families to guide them through the process of their loved one’s donation. LifeGift, Southwest Transplant Alliance and Texas Organ Sharing Alliance are founding members of the Donate Life Texas registry. Each day, transplant centers across Texas are recommending increasing numbers of patients for transplants, giving these medical professionals a unique and personal perspective of the rising demand for donor organs. The Texas Transplantation Society is a professional organization that serves as a resource and voice for the medical transplantation community statewide. The TTS has been instrumental in developing the registry’s framework and continues to be an invaluable supporter of donor registration to this day. 10 million registered Texans is a lifesaving start. In the first half of this year, 625 people have received organ transplants thanks to registered donors in Texas and thousands more have been given the gift of sight through cornea and ocular tissue transplants. And, each year in the U.S., more than a million people receive donor tissue for a wide variety of medical needs ranging from orthopedic surgery to burn recovery. Having 10 million registered Texans helps make these medical miracles possible, but we still have more to do. With more people registered than ever before, many ask why the organ shortage continues. Unfortunately, the demand for transplants is rising faster than the number of donated organs, but not for the reasons you might think. On the demand side, the growing prevalence of diabetes and heart disease have increased the number of people added to the transplant waiting list. Thanks to medical advances, transplants have become far more common and have shown to be reliable treatments for more kinds of conditions than in the past. On the donation side, very few things prevent organ donation, but how a person dies often makes donation impossible. In fact, only about 1-2% of people die in ways that allow donation – causes such as a stroke or traumatic brain injury. Of the 178,000+ people who passed away in Texas in 2013, only about 3,000 met the initial criteria to be considered for organ donation. This number then drops even further if consent is denied or if the organs are not clinically viable for transplantation. Registering with Donate Life Texas records a person’s legal decision to be a donor so it can be known by the right people at the right time to save lives. In the simplest terms, donor registration helps ensure that every transplantable organ can become a gift of life. Talk with your friends and family about donation and encourage them to register. Find a Donate Life Texas Organization in your area and become a volunteer advocate. Make a financial gift to support the Donate Life Texas donor registry. Share your Donate Life Story on the Donate Life Texas website. When applying for or renewing your driver license or ID, tell the DPS office staff why donation is important to you. Most of all, THANK YOU for registering to Donate Life! Each of us are one in 10 million, but to the person waiting for a transplant, a Donor Hero is their one hope for a second chance at life.